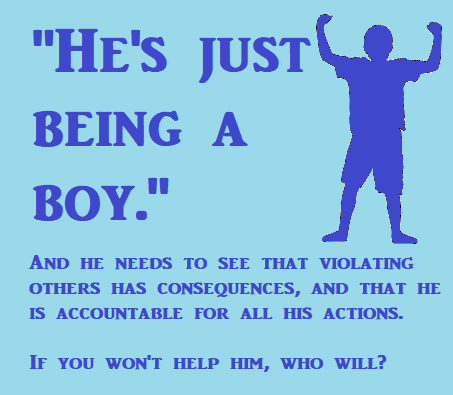 Kent's "Hooligan Libertarian" Blog: "He's just being a boy"
"He's just being a boy"
So many times I see those words used to excuse aggressive behavior or property violations by young boys. Yes, boys are often more active than... well, just about anything. Violent, even. There's nothing wrong with that. It's normal and natural, and doesn't have to be bad. In fact, it can be a great thing. However, they will never learn to channel that energy into good behavior if no one will hold them accountable and show them that aggression and property violations have consequences, and are not OK. Saying "Well, he's just being a boy" or "Boys will be boys" trains him to believe it's OK to violate other people. You might even end up raising a cop! Boys (and girls) can be violent and active without being aggressive. Violence is ethically neutral, but no one has the right to initiate force or violate the property of others-- even if you believe they are too young to understand. Of course, leading by example is a huge part of teaching this lesson; possibly the hardest part. If you won't start teaching them healthy principles while they are young enough to really make this a part of themselves, when will you get around to it?